It’s probably my fault that this pump is going to cost me a small fortune: when discussing pumps before even Amy had decided I’d shown her a web site that many of you know – FunkyPumpers.com – which had pump belts for sale. Amy had spied the One Direction pump belt they sell with eagerness. Getting the pump so soon meant we weren’t organised enough to sort out a pump belt so last Thursday, when Amy got her pump, she had no choice but to wear a belt to clip the belt too as the pump didn’t fit in her shorts pocket. So which belt is right then? We looked at all the belts available on FunkyPumpers.com which was difficult as they have so many good ones. Amy liked the One Direction one but worried what would happen if she went off them. We looked at cotton ones, plain ones, denim ones, on and on and on. Then I saw that FunkyPumpers sold SPIbelts, a belt I’ve heard of and seen before. I knew that the principle is that they’re comfortable to wear and don’t move around much. Realising that they would fit an insulin pump inside was a breakthrough. Unfortunately Amy wasn’t particularly sold on any of the designs FunkyPumpers sold so I headed off to Wiggle.co.uk, a cycling-centric site which is quite local to us. After what seemed like and age we found the one for Sheldon (that’s what Amy’s pump is called), it was a pink camouflage one. It was ordered on Sunday and arrived today (Wednesday). As soon as Amy put it on she said how comfortable it was, she’s been wearing it ever since. The material feels cool and smooth so no chance of itching or getting too hot. As with all pump belts you can wrap the excess tube up and stuff it inside the belt. It looks cool so it will look good over clothes and feel comfortable underneath clothes. Going on a pump isn’t just a simple case of plug in and go, it involves a fair bit of work, but nothing insurmountable or problematic, just stuff which needs to be done. 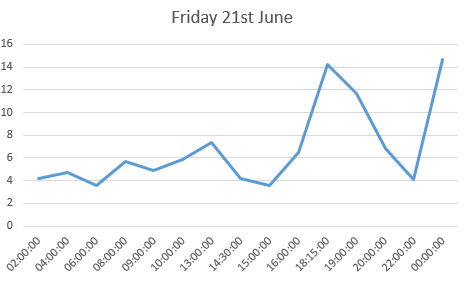 Initially your DSN (diabetes specialist nurse) works out what they believe the best basal profile is for you, doing this by asking lots of questions about lifestyle & food and checking backing weeks of log book entries – that is if you’ve been good and filled in your log book, we hadn’t! So there’s my first tip: make sure you fill in your log book for a few weeks beforehand if you’re not doing it religiously already. Does your DSN actually need to touch your pump? Ever? It was a good point and on reflection neither our DSN nor our Animas pump rep has touched Amy’s pump, certainly not to input or change anything, and I’m pretty sure they’ve not touched it at all. So that’s good then, we’ve been trained correctly. I suppose it’s oh so easy to hand over your pump to the DSN and get them to change the settings but what do you do when you need to change anything in the future? Would you know how to do it? In our case Amy is a whizz with things like this so she set up the pump, with me trying to look over her shoulder to make sure they settings were right. So, for us, not only has the pump not really been touched by the DSN, nor the rep, nor the Doctor, it hasn’t really been touched much by us, the parents. As you’ve probably read I’ve been worried how much my hospital are ok with using Animas as we’re the first in paediatrics in the hospital to have an Animas pump. So it was nice to hear from the DSN who was inspecting the new log book that it was one of the best ones and she’d like us to use it, rather than continue with the Roche one we’d (rarely) been using up to now. 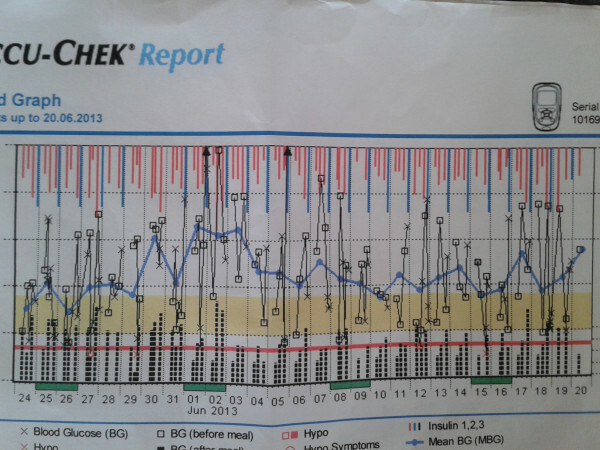 Each day takes up two facing sides, with the top page having columns for each hourly block and rows for readings/values: blood glucose; carb grams; BG bolus (correction doses); Carb Bolus; basal rate; basal rate change; temp basal rate; ketones; set change (tickable). On the bottom page there’s spaces to write information about food and a big notes area to write notes and things like ‘had a very lazy day’. Our DSN had requested that we test Amy’s blood glucose everything two hours, put the entry into the pump and trust the pump’s suggestion. It seemed a strange request, of course we’d do that, but I guess that some people battle against it and then wonder why their levels are all over the place. I was grateful that it was only 48 hours as a twitter friend of mine, who’s son went on a pump a week ago, has been asked to do it for one week! These tests were to happen every two hours for 48 hours, including throughout the night so Jane and I divided the shifts with me doing the 10pm, midnight and 6am shifts and Jane taking on the 2am and 4am. This minimised the tiredness levels for both of us, although not by much. It didn’t seem too tiring initially although I got through most of Friday and Saturday relying on caffeine and much yawning. Luckily Amy managed to almost sleep through all 2am and 4am checks. From midday Saturday, approximately 48 hours after going on the pump, Amy was taking part in a large choral concert so was without us for many hours. She coped well, still ecstatic about her pump. Our DSN works Monday to Friday but called us on Saturday in her own time to check how things were going; they were going well. She called again later that day and again on Sunday. So far between us we’ve decided that no changes are required to the basal and that we should continue with the current settings. We’ve got our advanced pump training tomorrow so there may be some changes made then. After our carbohydrate counting training refresher yesterday morning we stayed at the hospital for lunch as we were due to have a demo. It was all a bit of a rush as we only had 40 minutes to each lunch and switch locations, something not helped by spending 10 minutes trying to decide which sandwich to buy: Amy hates sandwich fillings, there’s nothing she likes that a sandwich retailer would sell. Luckily after 10 minutes I spotted the jacket potatoes. All fed and watered we went to our demo. The pump demo was also being given to a husband & wife whose little 5 year old is also due to go on a pump after having diabetes for one year – they’d been sat next to us on the carb course. Our DSN arrived with pump demonstrator Helen who was pulling a huge crate of pump supplies and accessories. I understood that this was due to be an informal chat about the pump with one of Winchester’s nurses, so I was very pleased to find out Helen is one of Roche’s pump specialist nurses. This was good news, we were likely to find out far more information than I originally thought. Helen gave both families a demo box containing the pump and meter. The sturdy looking box had been prettified, kiddified, to aid presentation but Amy opened it up faster than she unwraps Christmas presents and started playing with the pump straight away. Amy stole ours, I didn’t get a look in. 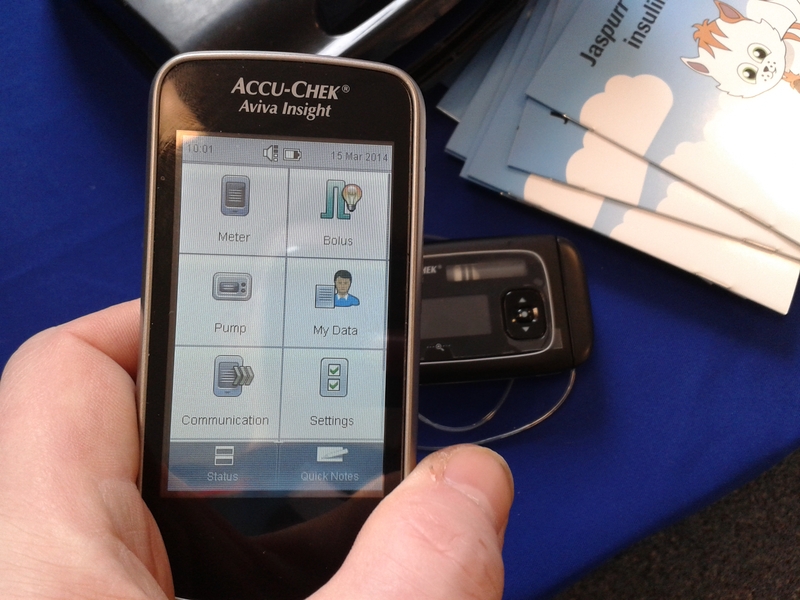 Helen demoed the functions to us, a job made easier as both families were already using Roche’s Accu-check Aviva Expert meter, which turns out to be virtually the same meter as used with the Combo pump. Roche had clearly been quite clever with releasing the meter for non-pump users as it makes the transition from their meter to their pump so much easier for everyone: the nurses; the parents; the kids. Helen told us that the meter was originally released for the pump and later amended to work for people on injections. 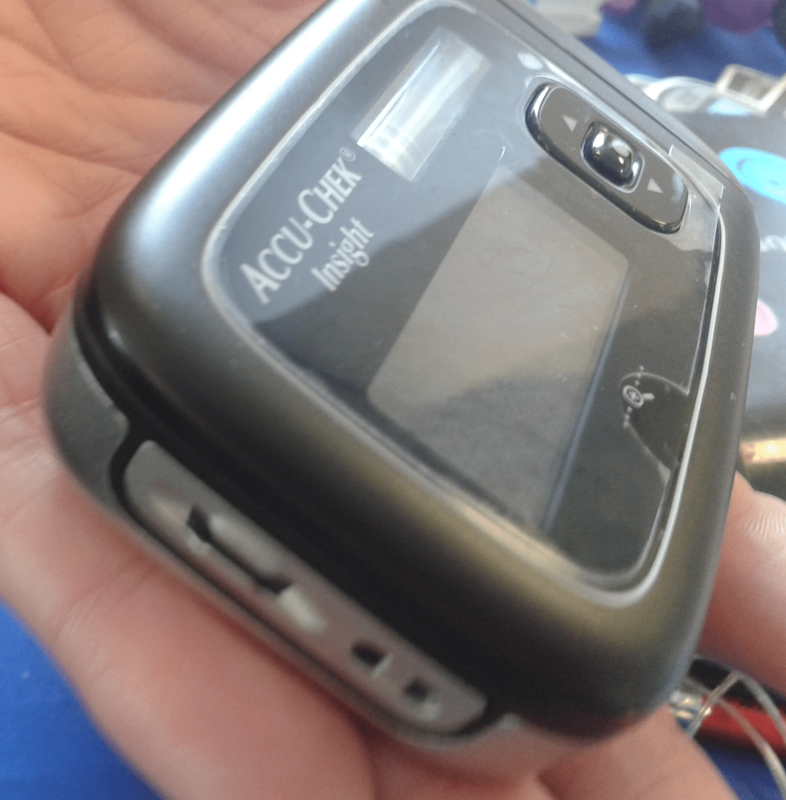 Amy had been using the Accu-chek Aviva Expert meter now for some time and it’s been great for her/us because of its bolus advisor. 4. adjust the insulin amount depending on whether they’re high or low, and figuring out whether they already have insulin in their body which is still ‘active’ or ‘on-board’ as we all say. 5.3. do an ‘air-shot’ removing any air in the new needle, we use/waste 2 units of insulin for this. 5.6. inject insulin, counting to ten whilst the needle is in. 6. finally they can eat. Diabetes is exhausting, you can see why. 3. inject insulin, using steps 5.1 through 5.6 above. If you’re on MDI (multiple daily injections) then I suggest you take a look at this meter, it really does make life easier, so much so that I can’t understand why anyone on MDI wouldn’t use it. The only key difference between the Combo meter and the Expert is the addition of a ‘pump’ settings menu, where you can set the various bits to do with the pump. Helen demoed the meter, a few seconds behind Amy who’d already sussed it out, without any explanation. Amy hadn’t really listened to Helen but I could see that Amy had already given a bolus for the virtual 225g she’d eaten and the pump whirred away quietly giving it’s virtual insulin, or air as we like to call it. So within minutes Amy had already become proficient enough to use the pump. There’s obviously more technical stuff to learn but the simple stuff is just that: simple. 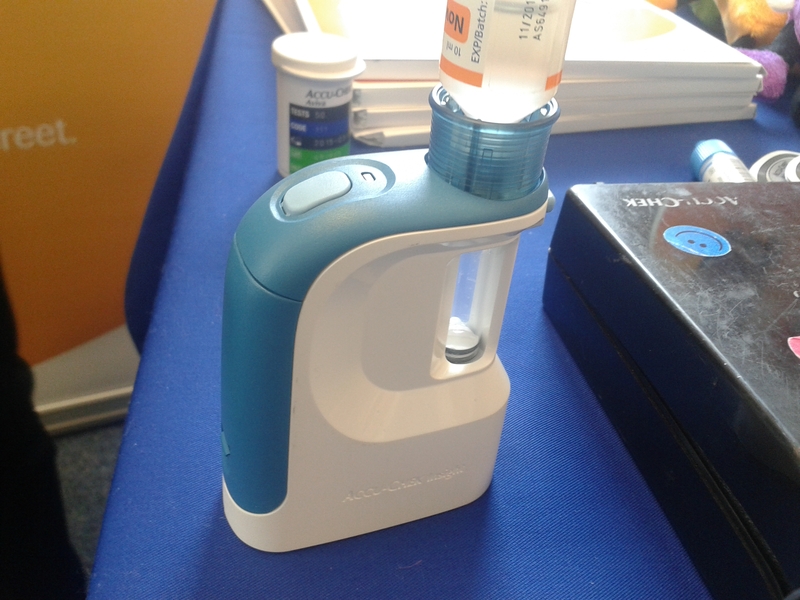 The pump itself is quite small measuring roughly 8cm x 6cm by 2cm and weighs in at only 110g when full of insulin. Like the Ford Model T car you can get it in many colours such as black, black or black. They do give you lots of stickers to customise it with though. The pump is waterproofed as much as any other pump but for some strange reason Roche suggest you don’t get it wet, just in case the casing has cracked after leaving the factory. This is certainly not a plus point for this point; they might as well tell us it’s not waterproof. The pump runs on an AA battery which they supply, but more importantly they’re available everywhere. If you run out at any vital point the chances are you can at least borrow a battery from a remote control or camera or something. The pump should last up to 25 days on a single battery. 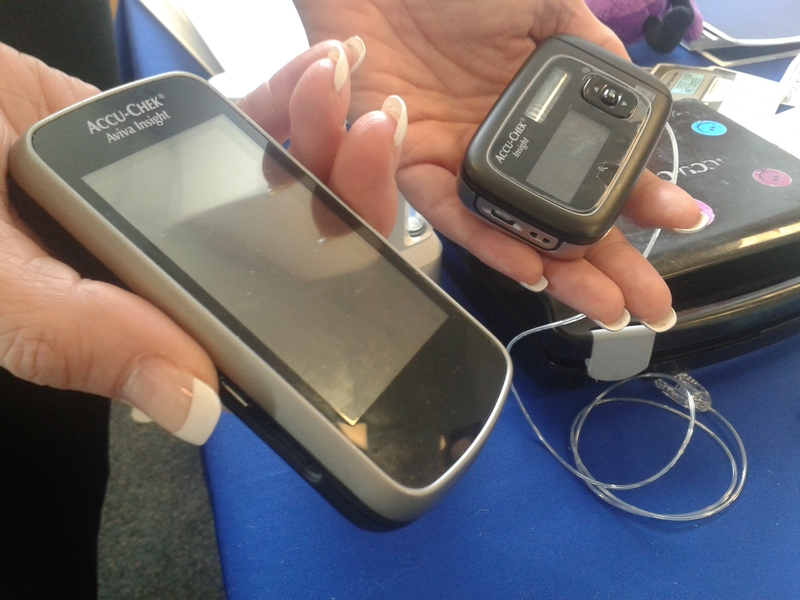 Helen demoed the three types of infusion set – the part that sits on and in the body with its little canula. Rapid-D Link: The first set is very small as has a metal cannula either 6mm, 8mm, 10mm or 12mm long. The great thing about this set is that you just hold it as you would for an injection and push it in the skin. Helen demoed it on our DSN – lucky her! – who I’m glad to say didn’t move, cry or scream. The only downside I could see was that it has a trailing bit of tube, a few inches long, which will always be there, even if you disconnect the pump to go swimming etc..
Flexlink: The second infusion set was the called the Flexlink. It was the one Amy had seen before; the one which made her realise her fears of something metal inside her didn’t need to stop her from getting a pump. The Flexlink features a soft teflon cannula which can be disconnected at the infusion set, without any trailing tubes once disconnected. It’s great that it’s got a teflon cannula, it solves Amy’s issue, but there is a downside: being flexible means it needs to be inserted with a special inserter. This didn’t bother us as the process seemed very quick as Helen inserted the set on/in her, but the other family quite rightly said ‘oh great, another bit of equipment to carry around’. Tenderlink: The third infusion set was called the Tenderlink and gives the benefit of being able to insert it at an angle, especially useful for fit/lean people who have less body fat. It’s inserted by hand at any angle between 20 and 45 degrees. Once in the needle within the cannula is easily removed and the pump tubing clipped on. Honestly though that needle looked huge and I can’t imagine Amy doing this herself. I’d previously told Helen about Amy and fears of metal cannulas and this one is the one when Helen told Amy not to look, I can see why. Easy choice: It was a simple choice, Flexlink it would be if we go for a Roche pump. Insertion is easy with the tool which makes it nigh on impossible to get wrong; the soft teflon cannula cures Amy’s needle-in-the-body fears. I can imagine Amy being able to do this set change herself without problem. In my mind there’s only one downside to this pump: it has no ability to work with a CGM (continuous glucose monitor). Helen said it never will and that any other devices from them aren’t likely to reach the market place within the next couple of years. This isn’t a massive downside as such as it’s always possible to purchase – for example – a Dexcom G4 CGMS but you’d have to fork out £650 for the Dexcom’s display unit, something you would not have to do/spend if you had an Animas Vibe, as it’s built in on that device. When you take on a pump it’s a 4 year plan, you can’t upgrade (I asked) if a new better pump comes along. Amy’s 12 at the moment and over the course of the next four years will go through some of the most glucose-challenging years possible. She’ll take GCSEs for probably three years on the trot and it would seem a CGM during these times would be incredibly useful. For those reasons I’m very interested in self-funding CGM, even though it’s incredibly expensive (up to £240 per month). We’d probably only use the CGM when required, to save money, but I’d really like the possibility of doing it, without having to fork out £650 for G4’s monitoring device. This has got to best the best selling point about the Combo; I can imagine they win over their competitors so much because of this. The meter is connected to the pump via Bluetooth (ooh Bluetooth says my inner geek). After the user has done a blood test and entered the meal’s carbs on the meter they press one button and the pump is instructed to deliver the insulin. That’s it! So what that means in reality is that the pump does not need to be accessed. If it’s hidden under clothing, or wedged in a pocket, it doesn’t need to be removed, or touched. You tell me a 12 year old who doesn’t think this is cool. CGM or not this pump is the strongest contender at this stage. Medtronic is out IMO so only the Animas Vibe can beat this one.